We’d love your help. 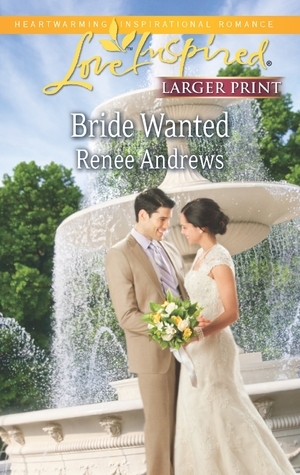 Let us know what’s wrong with this preview of Bride Wanted by Renee Andrews. To ask other readers questions about Bride Wanted, please sign up. I absolutely loved this! Just the whole idea of this story was so sweet! A definite fav! This is the 2nd book I read by Renee Andrews. The only thing I liked about this story is the Christian theme. Everything else about this story didn't interest me. Troy is a true southern gentleman Sometimes a girl just wants to sit down with a sweet romance and relax. That is what the Love Inspired line from Harlequin is for me. When I want to escape for a bit and not have to think to hard about what I'm reading, this is where I head. I know the Love Inspired line will keep it clean which I also appreciate. Both Troy Lee and Destiny Porter were very strong characters. I liked that the fact Troy was a mechanic at a gas station didn't become an issue in this book - with him or her...I always hate when a guy's choice of careers embarrasses him...I also enjoyed that the man was allowed to be the man and the woman was a lady - not a feminist...This was just a sweet, romantic book. This book reminded me of a Hallmark channel movie! I loved it and read it in one sitting. I gave this book 5/5 stars. The story itself is pretty typical of two people misunderstanding each other and getting wires crossed. This of course leads to some great reading. It also leads them to eventually find each other. The element of the main male character being the one writing letters to his future wife was especially enjoyed. Most of the time you get the girl doing the writing so I enjoyed that th This book reminded me of a Hallmark channel movie! I loved it and read it in one sitting. I gave this book 5/5 stars. The story itself is pretty typical of two people misunderstanding each other and getting wires crossed. This of course leads to some great reading. It also leads them to eventually find each other. The element of the main male character being the one writing letters to his future wife was especially enjoyed. Most of the time you get the girl doing the writing so I enjoyed that this author did a twist on that story line. I would recommend this book to anyone who enjoys quick, clean and entertaining love stories! Troy lee has been writing letters to his future wife since he was twelve. Now, fifteen years later, a few of the letters have found their way into the hands of a magazine owner who wants to publish them. But first she has to get his permission, so Destiny arrives in Claremont with that purpose in mind. Time passes and as she gets to know Troy and the people of the town, she changes her mind about printing the letters, because it turns out they were written to her. Well Another trip to Claremont. Troy lee has been writing letters to his future wife since he was twelve. Now, fifteen years later, a few of the letters have found their way into the hands of a magazine owner who wants to publish them. But first she has to get his permission, so Destiny arrives in Claremont with that purpose in mind. Time passes and as she gets to know Troy and the people of the town, she changes her mind about printing the letters, because it turns out they were written to her. Well, until Troy finds out about her original intention. Then he decides maybe the bachelor life is for him. I really enjoyed this book! It was so wonderfully descriptive and the setting was wonderful! I would so love to live in a little town where everyone was like that were so close! I really liked all the characters and just wanted to keep reading and reading! I am so looking forward to more books by this author!!! Reviewed from a NetGalley copy. Thank you, Harlequin Love Inspired! Fun story, but the religious aspect was a little to blatant for me-maybe not as natural as some. Still, the characters and plot were clever and fun. Clean romance!